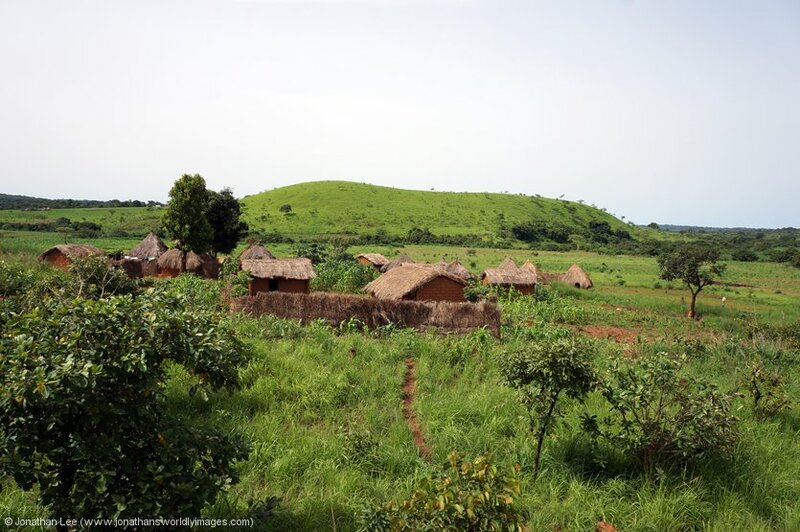 A trip to Africa had been long overdue since my last jaunt to Malawi & Mozambique in 2012. 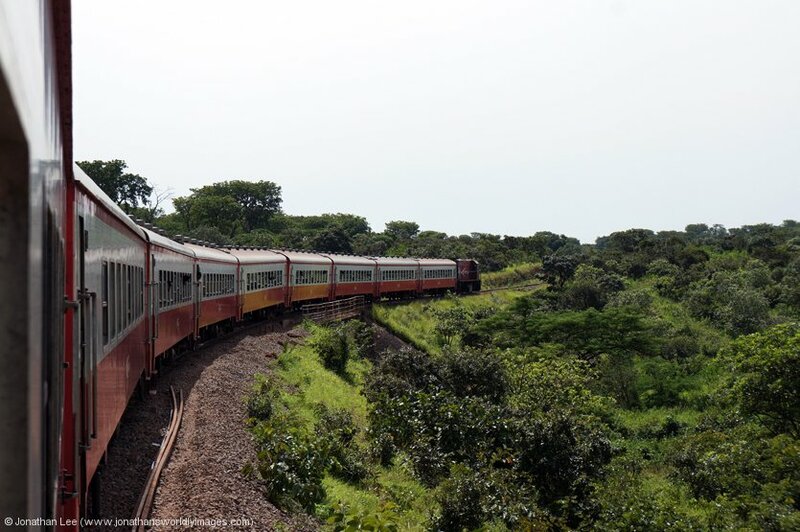 Both Senegal & Cameroon had been on the horizon for a while but with Senegal having a spate of not running trains in Dakar at all planning this trip was somewhat delayed, by about 3 years, and could well have scuppered the very reasons for heading into Cameroon as a result. 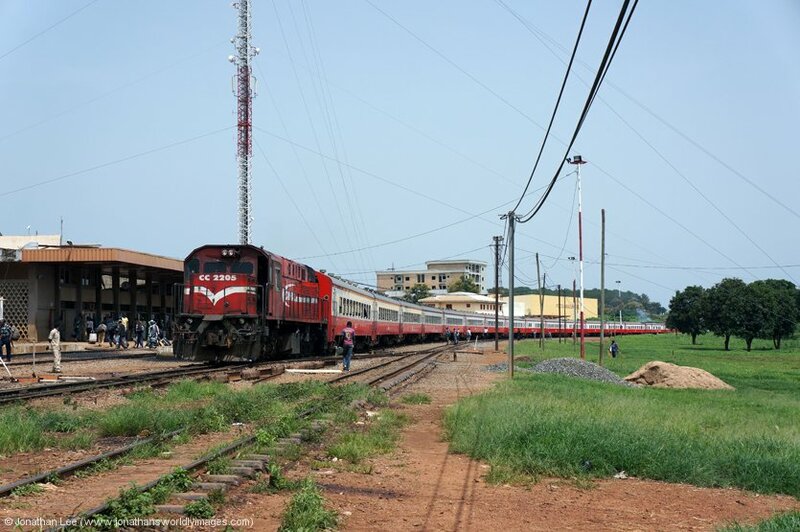 The Senegalese fleet of 5 YDM4’s and their 12 cylinder DLW built Alco were now back in full swing on the commuter services out of Dakar but things in Cameroon may have taken a wrong turn with the influx of Grindrod GM’s over the last few years. The CamRail MLW’s had previously worked the Yaoundé to N’gaoundéré overnight service solidly but nobody could confirm if they still did at the time of our trip planning so it could well be one of those “you’re a bit too late” trips; and with the odd sighting on the internet of GM’s working services our time in Cameroon could well be spent looking for something other than trains to do if the MLW’s had stopped working passenger services. 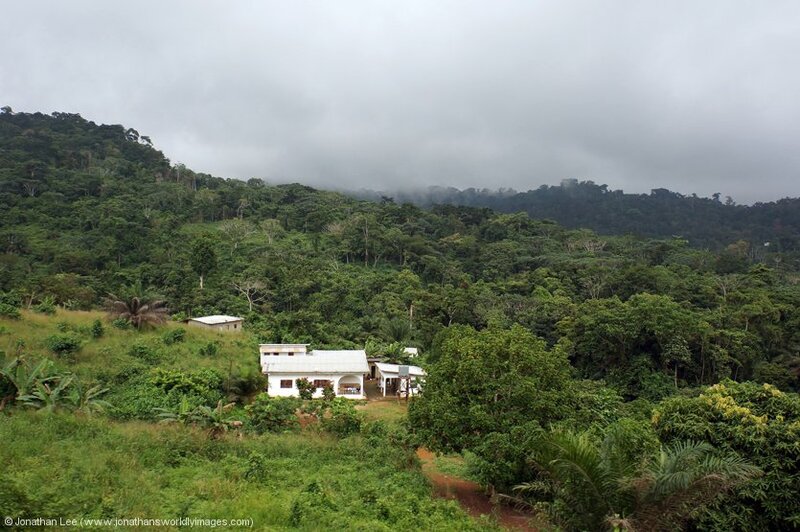 Cameroon (Douala) – Hotel Beausejour Mirabel – about 3km from Douala Bessengué station and about a 15-minute journey from the airport by taxi, on empty roads. We chose it for its relative cheapness, decent reviews and locality to the station. First impressions of the reception implied that it was a bit rough round the edges and when we got to our rooms on the first floor, the rooms confirmed this. While rough around the edged the beds were comfy and the bedding clean, the AC was already on in the room for us, as was the TV. The rooms were sizeable and the AC effective but very noisy unfortunately. 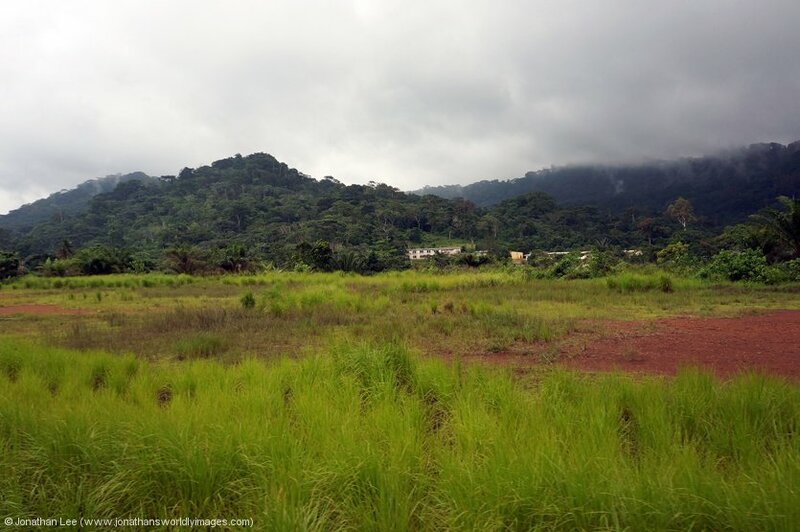 Cameroon (Yaoundé) – Hotel La Falaise – is a 20-minute walk from Yaoundé station and has security checks at its entrance; our bags were searched. Our twin room on the 7th floor had everything you would expect for a “decent” hotel, with toiletries, tea/coffee making facilities and free bottled water. There was a fridge, decent flat screen TV and the AC worked a treat. The room was spacious and the bathroom was as spotless as it. We’d paid about £100 per night for it but the quality matched the price and breakfast was included in the rate. On departing Senegal, at Dakar airport, we were handed an immigration form to fill out with our boarding cards and having filled it out we were through immigration quickly and having breakfast airside; which we paid for in Euro’s and got change back in Euro’s! Our Asky flight to Lomé, Togo, should have departed at 0900 but there was no sign of it by then so we had a look online, using the free airport WiFi, and flight radar showed it en-route from Bissau, Guinea. It eventually arrived at 0935 and was berthed by 0945. Unfortunately, even though everyone was on board by just after 1000, we didn’t take off until 1039! Luckily we had a 2h20m connection in Lomé for our connecting flight to Douala, Cameroon. Our plane for Asky flight KP34 1450 Lomé – Douala was on the stand when we arrived into the departures area; having gone through a security check. By 1450 though it was no closer to boarding and ultimately we managed to pick some words out of the only announcement that was made; which basically said all flights were delayed due to bad weather. While it was gloriously sunny outside the airport windows we were soon to find out that bad weather was on its way. Initially it started to cloud over and then it began to get dark, when it started to rain it didn’t seem to be anything to be concerned about but at its height we could barely see the plane through the windows as it was that heavy and hard! Planes were being held above the storm until it subsided and the lack of top notch workmanship soon began to tell, throughout the brand new terminal building, which was still in the process of being completed, as rain water began to leak in at various places; which of course kept the airport staff rather busy. With there being no other announcements we ultimately had to ask a member of staff how long the delay would be; who of course had no clue at all and could only tell us the delays were due to the weather! While the delay wasn’t the be all and end all it did mean that our hotel pick-up in Douala would be a problem so I rang the hotel to tell them we’d be delayed; it was an interesting conversation as the guy at the other end spoke virtually no English but did understand what time I’d told him we expected to be into Douala; which went out of the window when we eventually boarded 90 minutes later so a further phone call had to be made as we boarded. Even this call turned out to be a waste of time as we sat on the stand for 40 minutes after boarding, waiting for stragglers who must have been coming off connecting flights that had been delayed coming into Lomé. Eventually we landed into Douala at 2015, 2h35m late; and if the delay wasn’t enough we were parked on the extremity of the runway for the plane to berth overnight and the bus to collect everyone wasn’t big enough so we had to wait another 10 minutes for it to do a second round trip to collect the stragglers. Once in the airport we had to fill out a landing card and present it with our passport at the immigration desk, which by the time we got to it didn’t have much of a queue. Thankfully it took seconds to get through immigration and the moment I was through I rang the hotel again; thankfully their driver was at the airport waiting for us and after we’d appeared land-side we soon clapped eyes on a sign with my name on it. Just as we got to our guy his phone rang; it was the hotel telling him we’d arrived! We needed to change some money and there were plenty of folk willing to do it but there didn’t seem to be any change booths at the airport. Our taxi driver told us we’d be able to do it at the hotel but when we were almost there his tune changed as we picked up a money changer en-route. Everything was very amicable though and there was no hassle. Once we’d checked in at the hotel we logged on to the WiFi to check the current exchange rates against the pound Sterling. The money changing guy was more than happy to wait while we did this and wasn’t forceful at all and while we found the bank exchange rate to be 839 XOF to the £1 we fully expected it to be less than 800 XOF to the £1 for the tourist rate. Initially we were offered 700 XOF but settled on 750 XOF and changed £200. The changer was even happy for us to validate the notes he’d given us against some other notes that people had in the foyer as we’d never seen the currency before and for all we knew they could have been fakes. All was well though and we handed over our money, the taxi driver then took the changer back to where he’d picked him up from. The Hotel Beausejour Mirabel was about 3km from Douala Bessengué station and about a 15-minute journey from the airport by taxi, on empty roads. We chose it for its relative cheapness, decent reviews and locality to the station. First impressions of the reception implied that it was a bit rough round the edges and when we got to our rooms on the first floor, the rooms confirmed this. While rough around the edged the beds were comfy and the bedding clean, the AC was already on in the room for us, as was the TV. The rooms were sizeable and the AC effective but very noisy unfortunately. We used the hotel’s restaurant/bar to have a couple of beers before bedtime and settled down for the night around 2300; in quite tranquil surroundings, but for the noisy AC, which I eventually switched off! As breakfast was served until 10am we didn’t bother to get up until 0900! When I took my earplugs out the noise outside the window was quite loud, so I was thankful of them. The water in the hotel was piping hot and served us well. Unfortunately, we found out in the restaurant that breakfast wasn’t included in the room rate and 2500 XOF got us a croissant, a piece of bread, some jam and a cup of tea; not the best breakfast we’d ever had, after which we arranged with the same taxi driver from the previous night to be taken to the station at 1130 and retired to our rooms again. We ended up with a different taxi driver taking us in the end, who initially wanted to charge us 5000 XOF, which is how much we paid from the airport which is twice as far; we eventually settled on 3000 XOF and were delivered to the rather imposing Gare Bessengué some 10 minutes later, after negotiating the one-way system round the city. To get into the station building everyone has to have their bags checked, airport style, and then you’re free to roam around in the station building. It’s probably about 100m long from end to end and has a line of ticket windows immediately in front of the entrance; each is clearly marked with what tickets will be sold at each and there was only one person in front of us as we queued for 1st class tickets on the 1445 Intercity to Yaoundé Voyaguers. The prices for each class of ticket are well advertised at the ticket windows and the purchasing of our 1st class tickets took a couple of minutes, once we’d got to the window. We had to hand over our passports so our names could be written on the printed coach reservation sheet the woman had to work with. Tickets were then printed from a machine and our names and seat details hand written onto those as well; before we handed over 9000 XOF for each ticket. There are a couple of café type eateries in the station building but attached to it is a proper restaurant, which you can only gain entry to by walking back out of the main station building. Food served is buffet style and you choose what you want and it’s brought to your table for you. On offer was battered fish, roast potatoes, rice, and pepper sauce, something wrapped in leaves and grilled plantain. Each meal cost a mere 1500 XOF each and the food was piping hot, was of a good sized portion and very filling. English wasn’t fluently spoken but we managed to point at what we wanted and a hand written bill was handed over afterward; so we had no issues with the ordering or paying. As it is apparently illegal to photograph trains on CamRail property, according to others having made the trip to Cameroon, we didn’t bother trying to have a scout round outside the station area as there were a lot of security staff available and basically stood at the east end of the station to await the arrival of the inbound 1025 Yaoundé – Douala Intercity; which would at least be the stock to form our 1445, if not the loco as well. Plinted inside the station building is a narrow gauge 0-6-0 tank steam loco built in 1878 in France. At the side of it are windows offering an ample view of incoming trains from the east and even some of the yard area adjacent to the station. We could see the roofs of trains arriving into the yard and the first loco we spotted was General Motors GT22CU-3 CC2505; which eventually shunted a coach from the station into the shed, which is between the station and freight yard. We didn’t manage to spot the inbound Intercity arriving as we noticed people were being allowed through the gates at the west end of the station; with the gates at the west end being for 1st and premier class ticket holders and the ones at the east, by where we’d been stood, being for 2nd class ticket holders. Once through the gates everyone waits in an air conditioned lounge while the train arrives and is prepared for the return journey to Yaoundé. While waiting Bombardier MX620 CC2218 ran through the station towards the east end and we later spotted it on shed, which is a couple of kilometers out of Bessengué. 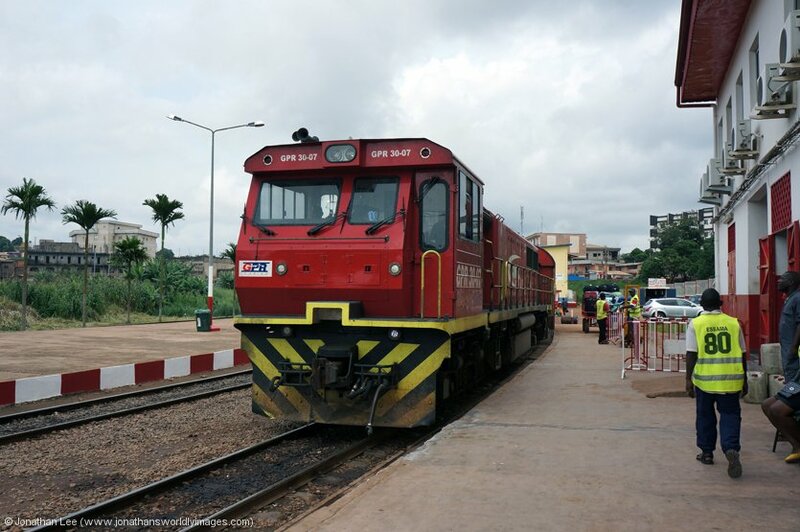 While we’d not been expecting to find a Bombardier MX620 on the Douala – Yaoundé intercity services it still didn’t stop us being a little disappointed when Grindrod Pembani Remgro (GPR) GM, GPR 30-07, arrived from Yaoundé and ultimately ran round to work back with the 1445, late running intercity; as it only arrived at 1440. 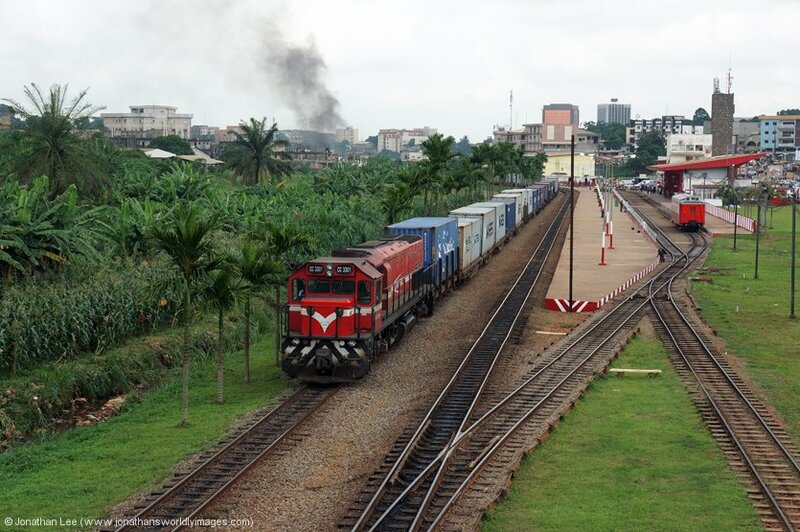 The train was load 10 with the 2nd class at the front from Douala and the premier & 1st class towards the rear. Just as we were allowed down onto the platform a green Bombardier MX620, which was so scruffy we couldn’t confirm whether it was CC2226 or CC2228, or indeed neither of the aforementioned! Boarding seemed to be pretty efficient with the coach number on the ticket being the actual coach number itself. Seat numbers are clearly marked but unfortunately we ended up with one of the few pairs of seats in the coach that had no window by it at all. Despite the hour late arrival the train was turned round and departed 28 minutes after arrival at 1508, only 23’ late. 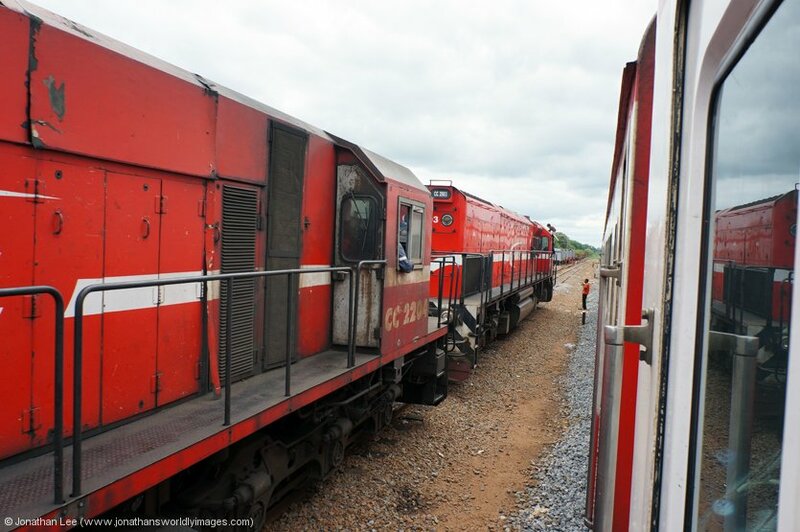 As we staggered out of town we spotted a few locos on the shed, which is on the left as trains depart Douala, namely NRE built GM GT26CU-3 CC3302, Bombardier MX620 CC2218 & GPR 30-01. En-route we noted Bombardier MX620’s CC2221/2204 (paired up) at Makendi and Bombardier MX620 CC2213, Alstom BB1111 and GPR 30-03/GPR30-04 (paired up) at Eskea; before finally overtaking and unidentified Alstom at Binguela with a passenger train, which we could only assume was actually vice DMU and working train 103 0900 Douala – Yaoundé Omnibus service; which was due into Douala at 1820 and ran on Monday’s, Wednesday’s and Friday’s. 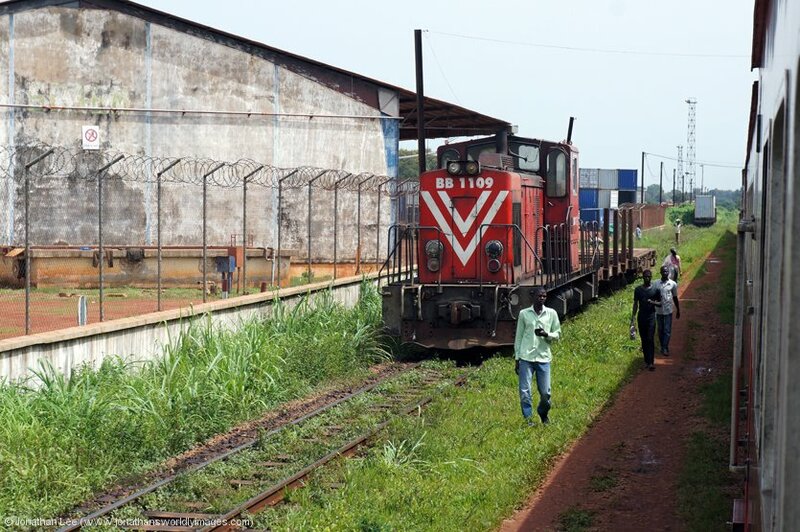 We had seen an Alstom DMU on the shed at Douala as well so maybe it wasn’t serviceable at the moment? The journey is quite scenic throughout, if you have a window to look out of, appears very tropical and is definitely very lush and green. The line-speeds along the route are quite good, except for staggering in/out of Douala & Yaoundé, but the stock doesn’t give the impression that it is as it doesn’t ride very well; the air conditioning works well though and on board a free cake, packet of nuts and bottle of water are handed out to all in 1st class. There’s also a trolley service of hot drinks, sandwiches and confectionary on board and the 1st class was wedged solid with no spare seats at all! Arrival into Yaoundé was at 1903, 33’ late. 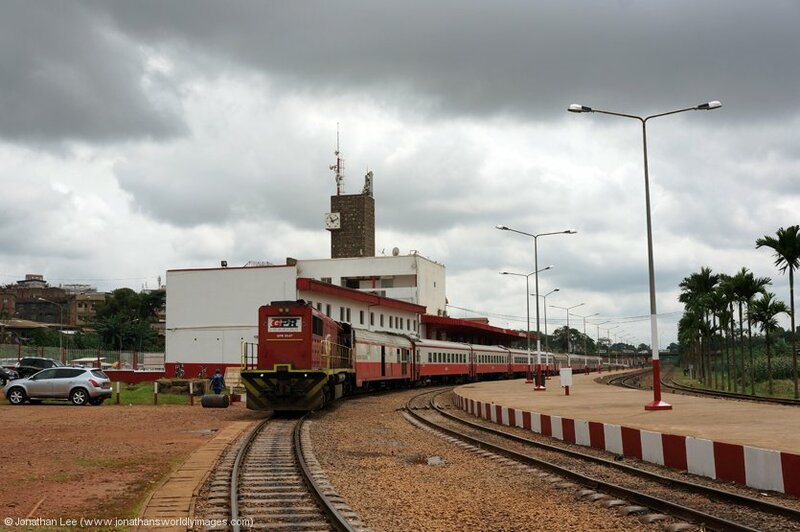 In the adjacent platform was a load 16 set of stock forming train 191 1910 Yaoundé – N’gaoundéré; with sleeper coaches to the rear, premier class in the middle and 2nd class at the front. 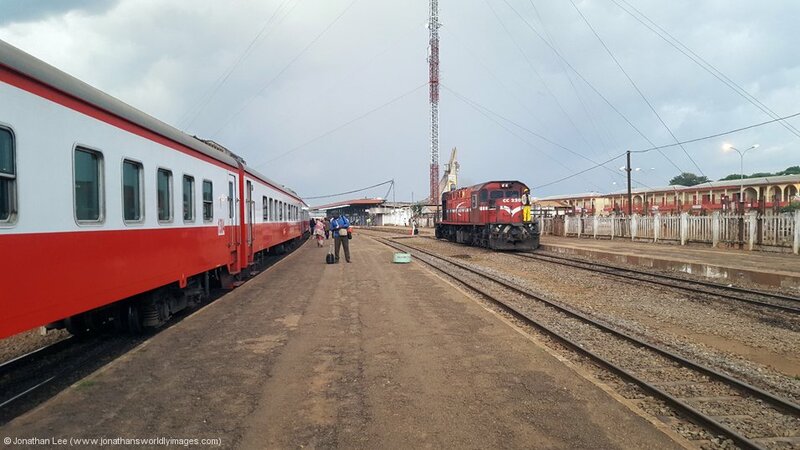 There was clearly a connection off the 1830 intercity arrival from Douala to the 1910 departure to N’gaoundéré yet we still managed to watch two people miss the train as it pulled away a few minutes late; the station staff just weren’t interested in stopping it for them at all! Thankfully for us, we were very pleased to find Bombardier MX620 CC2203 getting the train away; as the MX620’s were the sole reason for us being in the country! As the train departed we had to walk right back to the opposite end of the station to cross the tracks as GPR 30-07 had shunted an extra coach onto the end of the set and blocked our exit! 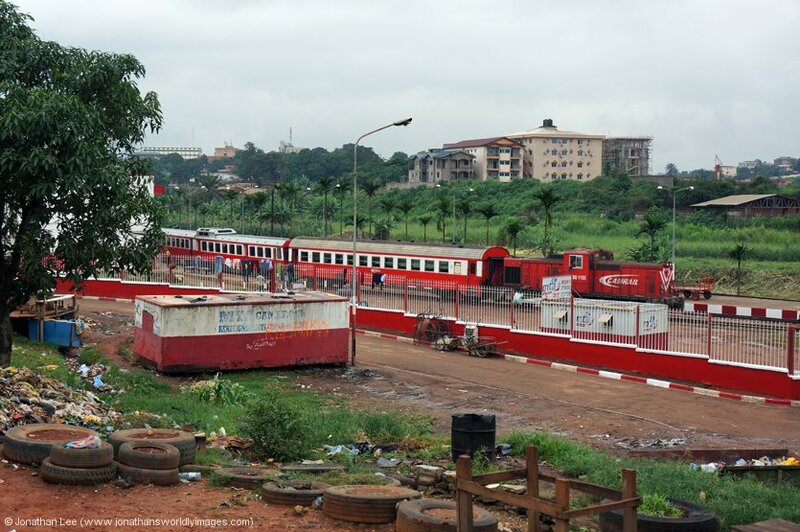 GPR 30-07 was running round to work back to Douala with train 154 1920 Yaoundé – Douala Intercity as were forced our way through the busy station building and out into the station forecourt; where the waiting taxi drivers gathered! Luckily we managed to get ourselves accosted by an English speaking one, who was very sociable with it. As we didn’t have anything smaller than a 10,000 note he was more than happy to wait while we changed some money at the hotel front desk. The Hotel La Falaise is only 1.5km from Yaoundé station but as it was dark we took a taxi instead. The girls at the front desk spoke good English and had us checked in straight away. As hotel prices in Yaoundé had seemed to be on the pricey side we ultimately booked a decent double room instead of two singles in a crappy hotel, with bad write-ups. The La Falaise had security checks at its entrance and our bags were searched. Our twin room on the 7th floor had everything you would expect for a “decent” hotel, with toiletries, tea/coffee making facilities and free bottled water. There was a fridge, decent flat screen TV and the AC worked a treat. The room was spacious and the bathroom was as spotless as it. We’d paid about £100 per night for it but the quality matched the price and breakfast was included in the rate. We had a good meal in the hotel restaurant, which while a little pricey, was very good quality; while watching France v Romania in the first match of the Euro 2016 Championships; which France won 2-1. And I will hand it to them it was with a cracking goal! We spent the rest of the evening pondering our strategy for the following day and decided to head to the footbridge, just north of Yaoundé station, to photograph train 192 1915 (P) N’gaoundéré – Yaoundé arrive before making any decisions about what moves we’d be considering throughout the week. Up at 0800 for breakfast, we were grateful of the lay-in. While there did seem to be plenty of choice, all of the hot stuff was more like stuff that would be eaten for dinner; definitely not at breakfast! Still, there was plenty of cold stuff for us to munch on before heading off out to the station to attempt photograph both the N’gaoundéré – Yaoundé overnight and the Douala – Yaoundé Intercity arrive. As Yaoundé is a bit like Sheffield and has hills in every direction, it was an interesting walk from the Hotel Falaise to Yaoundé station. As the crow flies it’s only about 1 kilometer but the walk is about 2 kilometers; with ME Maps at hand though there was no problem negotiating the busy morning streets, the sights of which were pretty much like those in Senegal but the tat selling seemed to be more organized and categorized as well. The rank smells wafting by every now and again certainly added to the fact that while the streets looked a bit more organized they were still treated like a toilet and there was rubbish everywhere there were sellers. Yet the non-descript streets with nobody lining them were quite clean and generally only had a few people milling about them. As we needed an injection of cash to buy our train tickets we had no problem finding a bank with an enclosed cash machine, which dispensed up to 250,000 XOF at a time. On our way from there towards the station we passed by a load of bars, that already had people sat outside them with their “first of the day” and despite us having walked through what appeared to be the electronics district, there hadn’t been that much of a hard sell coming our way and we’d had no hassle or attention from the locals at all. 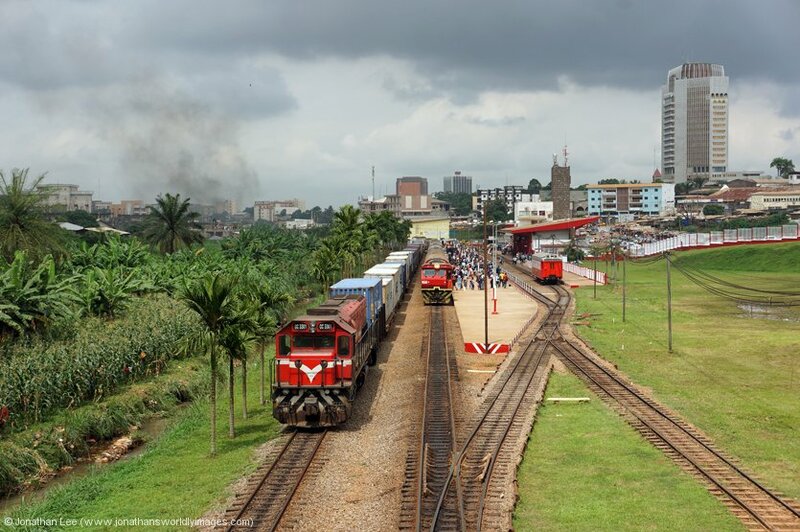 It was 0935 when we approached Yaoundé station area and we were surprised to find a set of stock already in the station and naturally assumed it to be that off IC151 0600 Douala – Yaoundé; which must have had a good run to take only 3h30m to do the run across from Douala. It was also a longer rake than the one we’d had the previous afternoon and we should have realised at that point that it could only have been the rake that had arrived off 192 1915 (P) N’gaoundéré – Yaoundé; but I think the fact that the loco attached to the Yaoundé end of the stock had us believing otherwise for more than one reason! 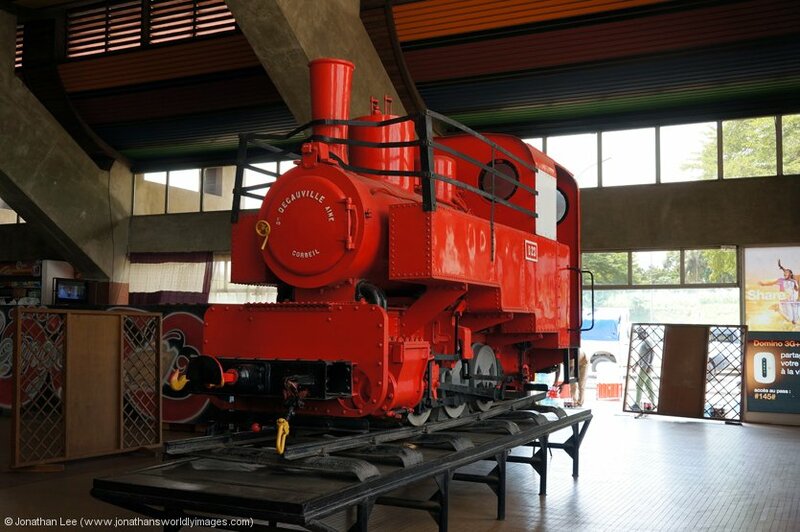 It was GM GT22CU-3 CC2506 and we assumed it would eventually run round and work back to Douala with IC152 1025 Yaoundé – Douala; it never, or seemingly didn’t want to cross our minds, that it could be the N’gaoundéré stock, after the loco had run round! There’s a footbridge at the N’gaoundéré end of the station, which offers great views across the station and also in the other direction of arriving trains from N’gaoundéré; we perch ourselves on this for the next hour or so and waited for the overnight from N’gaoundéré to arrive. When we were approached by a police officer, who had been directing traffic towards the station, we thought that was the end of our attempts to photograph. 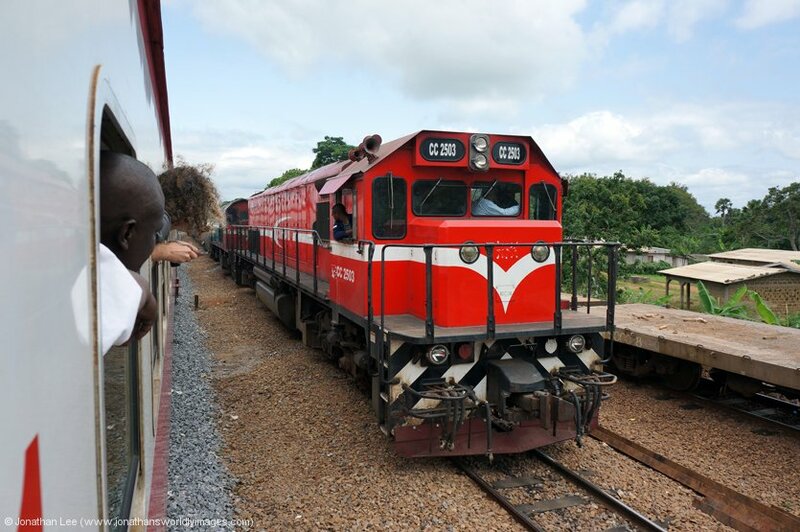 However, when we told him we were waiting for the N’gaoundéré train to arrive he told us it already had but the Douala train was late; we assumed he didn’t have a clue what he was talking about as CC2506 shunted its stock out of the station towards the yard area north of the station. We actually though it was going to propel its stock round the turning circle and draw back in to form the 1025 to Douala but when it didn’t we just thought that the inbound N’gaoundéré was running a tad late and there was no rush to get the Douala stock back in as CamRail were holding it for connections! We couldn’t have been more wrong about our friendly police officer and despite wanting money from us, which he didn’t get, he even stopped the traffic on the footbridge to allow us to cross and photograph GM GT26CU-3 CC3301, when it arrived into the loop with a freight from the Douala direction. 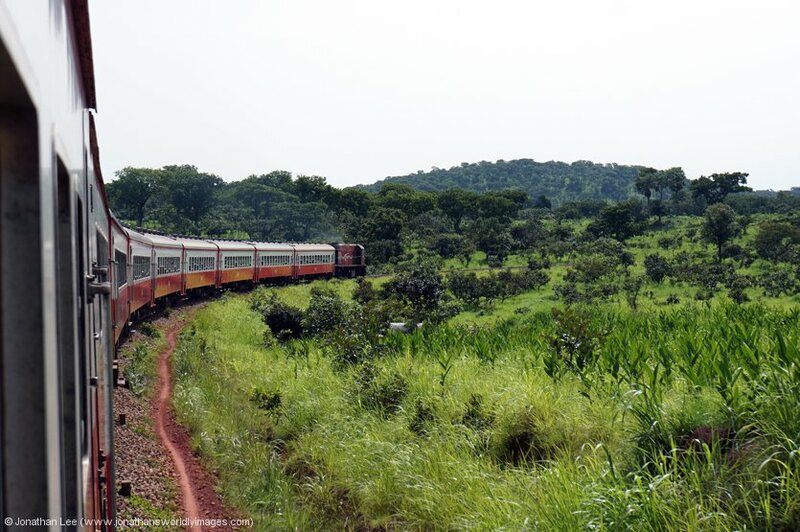 Everything soon sank in when Grindrod GPR 30-07 arrived into the station about 20 minutes later, at 1100, with the 1h20m late running IC151 0600 Douala – Yaoundé. A quick photo later and we were heading to the station, now a little concerned that GM CC2506 appeared to be in the mix on the N’gaoundéré circuit! Getting into the station building at Yaoundé involved having our bags checked, just like in Douala and buying tickets at Yaoundé station isn’t as straightforward as it seemed at Douala but there are a load of ticket windows inside the station building clearly marked with what tickets are available from each. 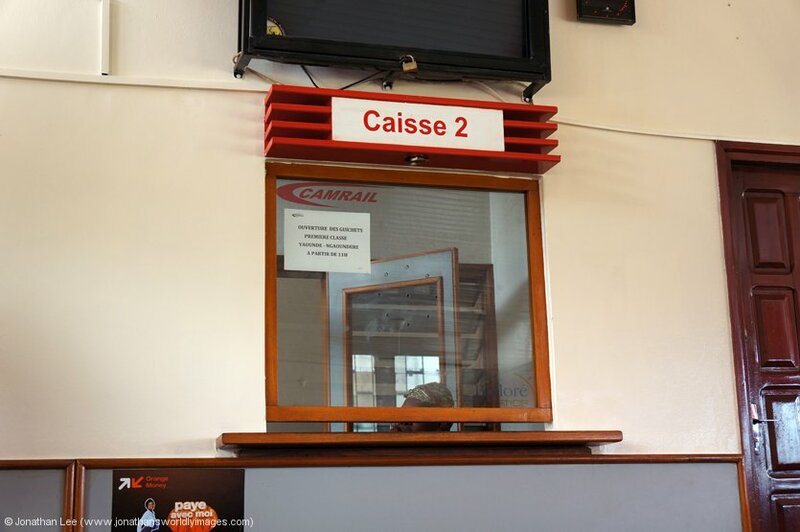 To the left of the ticket windows is an information office, which has a sign on the door advertising the fact that it sells tickets for N’gaoundéré and was the place to get tickets in sleeper coaches. As it opened at 1100 we basically walked straight in and were almost at the front of the queue from the off! 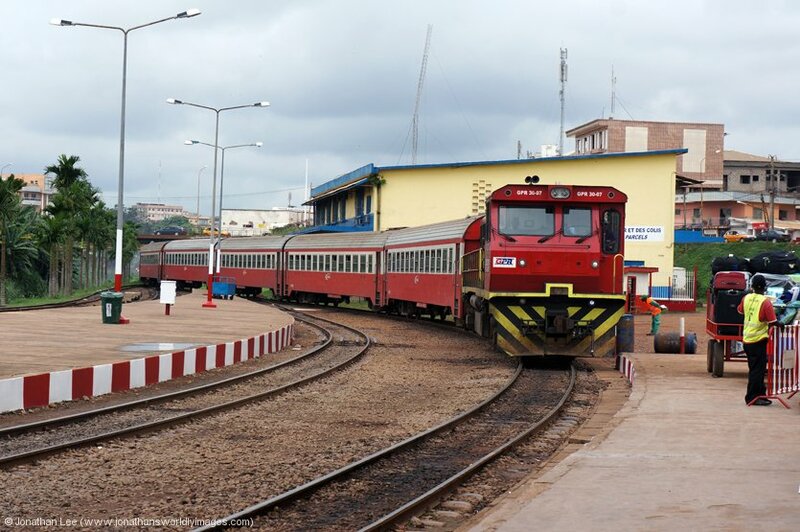 The whole ticket buying experience probably looked a bit more chaotic than it was due to the fact that the station was full of people waiting to board the late running IC152 1025 Yaoundé – Douala. Luckily for us the girl who initially served us spoke fluent English and we approached the ticket buying by asking when there were tickets available to N’gaoundéré, that would allow us to return straight away; the same night we’d arrived. We had no intention of attempting to head north that night with the GM being in town so started with Sunday night. Bizarrely there were two berths left on the train, the catch being they were in separate 4 berth cabins, in different coaches. The good news though, was that there was a two berth cabin available on Monday night heading back to Yaoundé so we went ahead to book what had been offered. The girl took our passports and entered our details onto a computer. What she’d actually done was reserve our berths for the Monday night southbound journey and then old us we had to pay for the tickets in N’gaoundéré. As the IC was about to start boarding for Douala she had to rush off and told us her colleague would sort out our ticket for the following night; and off she went. Her colleague thankfully spoke English and did indeed sort out our tickets for the following night but only the reservation of them. Once we’d been handed the reservations we were then directed up the stairs, opposite the information bureau, to pay for them. I did ask for the reservation details for our Monday night journey before leaving and was handed a piece of paper with the coach number on and told to hand it to the staff at the booking office in N’gaoundéré. There were already quite a lot of people upstairs but there was nothing going on at either counter initially. Soon enough though some staff turned up, one of which advised people which of the two counters to queue at, depending what tickets you’re paying for; the left hand one is for sleeper tickets and the right hand one for premier class tickets; which must mean that all other classes of tickets on the train must be available at the ticket windows downstairs. As we couldn’t understand the French directions we ultimately ended up at the back of our queue but it only took 5 minutes to get to the front; where the woman behind the counter uses the reservation receipt to write the details onto pre-printed tickets to your destination. Money is handed over, change is given and the transaction is then over! Simples……. The whole ticket buying experience, from entering the station to departing with our tickets, took about 40 minutes. 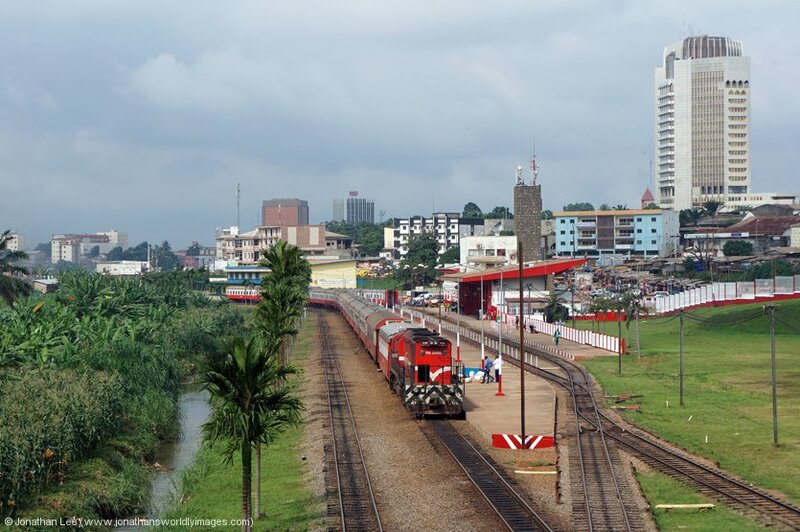 During which time GPR30-07 had run round and departed at 1125, 60’ late, with IC152 1025 Yaoundé – Douala. With the rest of the day ahead of us we decided to head across town and visit some of the sights; that idea was soon stopped in its tracks! We stopped off at Patisserie Select en-route to the National Museum, which has possibly the best array of things a bakery could serve, that I’ve ever seen! Everything looked fresh, from sarnies to pastries and cakes to ice cream, and there’s an area to eat inside the place; which came in rather handy when the heavens opened outside and it absolutely pounded it down. When it stopped there was a wave of water flowing down the street and the big roundabout at the bottom was becoming more like a lake with every minute; so not only did we had to dodge the cars trying to traverse it, we also had to avoid getting wet. Then the heavens opened again, and instantly became very heavy. Our only solution was to dash and shelter beneath a thin bit of concrete hoarding that was sticking out over a pathway; which we shared with two other guys and two young kids, for the next 20 minutes! Loads of taxis had pulled up and pipped as we stood, semi-dry, in our less than ideal shelter, but we let them all go; mainly as most had people in them already. Just as we were about to give up on the day the rain eased up and then stopped completely so we walked the 400m we had left to the front gates of the National Museum. When the guy at them wanted 10,000 XOF for us to enter we were soon heading back to the hotel where an afternoon of relaxing in air-conditioned luxury, while watching football, followed. Albania v Switzerland saw the Swiss come out on top with a 1-0 win. 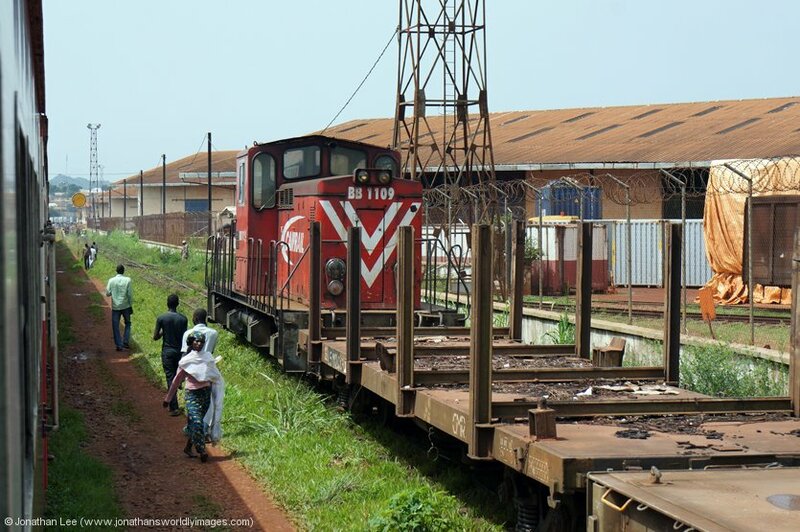 Our intentions were to walk back to the station and view the 1910 Yaoundé – N’gaoundéré depart but when the skies turned black again at about 1700 it had to be a brisk walk instead and we found the stock just being boarded with GM CC2506 already attached ready to take the train north. Having achieved what we needed to we opted for a taxi back to the hotel, rather than risk getting another soaking, which cost 2000 XOF from the top of the road, not the station area. We were back in time to watch the second match of the afternoon and Wales v Slovakia ended with Wales winning 2-1; so the pressure was on England later that night with Wales winning; and when that had finished we had enough time between that and the England v Russia match, that would kick off at 2000, to get ourselves something to eat in the restaurant; the steak with pepper sauce the previous night had gone down well so I settled for another before the disappointment that was the England football team managing to concede a goal 2 minutes into injury time to then draw with Russia! With no time for breakfast we were heading to the station at 0645 and found the streets a lot calmer than they had been the previous morning; probably because it was a Sunday? The 20-minute walk turned out to be a waste of time when we found Alstom centre-cab BB1103 sat waiting to depart with the 0730 Yaoundé – Douala Express; although we did at least get a photo of it from the cover of the trees at the Douala end of the station area, just outside the car park entrance. Then from out of nowhere came some guy with some sort of official ID and challenged us about the photos we’d just taken. He was definitely in some sort of force but we couldn’t tell which from his ID. Once he’d told us we couldn’t take photographs, as the station was a strategic location, he surprisingly left us to walk back to the hotel unscathed; with all our photos still preserved. After a much needed shower, a much needed breakfast followed before we were station bound again to photograph what we hoped would be Bombardier MX620 CC2203 arriving from N’gaoundéré with the inbound overnight. Having been stood on the same bridge we’d frequented the previous day, for about 30 minutes, we noticed an armed police officer paying a bit of attention to us from the other side of the bridge, as he walked over it. Sure enough, he was soon walking back across it, now on our side, and directly towards us. Obviously we stood out like a sore thumb but when we were asked what we were doing the officer couldn’t seem to get his head round the fact we were just passing time, waiting for trains to arrive; he then told us it was not allowed for people to stand on this particular footbridge and that we had to move! Of course it’s well signed all over it that this is the case; not! We were allowed to stand at one side or the other but after we’d tried both, and figured out our view was massively obscured we decided that we were heading to the station and were going to ask for permission to photograph there. We walked into the information office, where we’d got our reservations from the previous morning, and spoke to the same girl that had issued them. We asked for the Chef De Gare and she was soon on the phone, only to come off it and tell us that he wasn’t available as it was a Sunday and he wasn’t at the station. When we explained what we wanted she led us onto the platform and pointed out a woman who she said we should speak to. This woman turned out to be called Madame Nellie Desiree and couldn’t have been more helpful. She understood that we wanted to take photographs on the station and was happy for us to do so, just not so many though. She then told us that the inbound trains from both N’gaoundéré and Douala wouldn’t arrive until around 1100 and that we should return to the platform nearer the time; so we spent 30 minutes or so festering in the station waiting hall with a cold pop. After 30 minutes on the platform staff started to spread themselves out a bit and some passengers had managed to creep onto the platform. 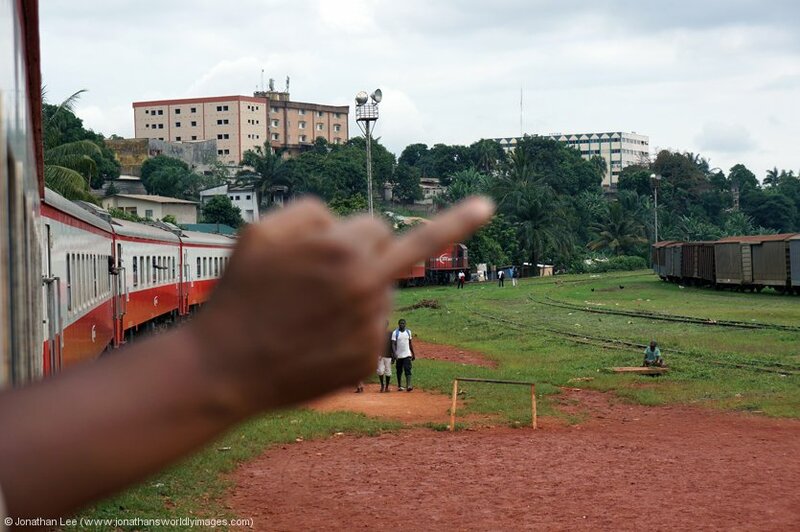 We were then told that the train was arriving from Douala and asked to stand out of the way; we negotiated a better place to stand to get our photos than they’d tried to put us in, behind everyone else! 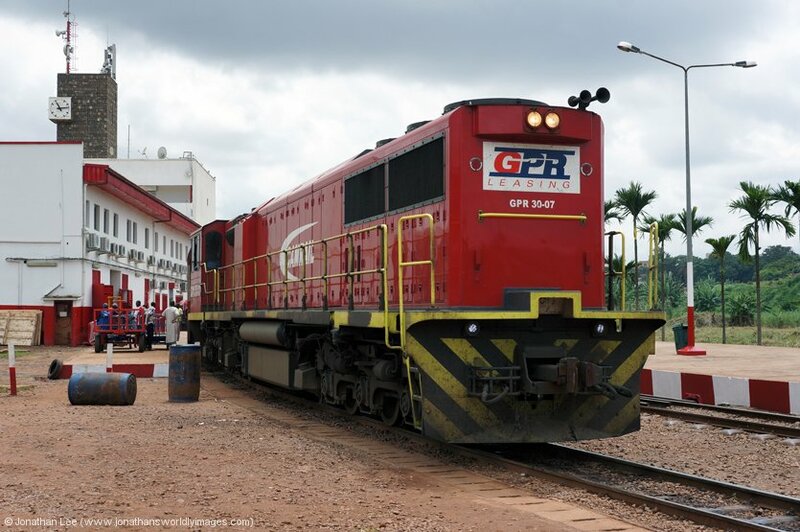 It was no surprise when Grindrod’s GPR30-07 arrived with IC151 0600 Douala – Yaoundé at 1055, 75’ late. The station became a hive of activity for about 40 minutes as people alighted, the train was cleaned, the luggage was loaded and the loco was run round; and while people were boarding Madame Desiree allowed us off the end of the platform to get some photos of GPR30-07 before it departed with IC152 1025 Yaoundé – Douala 64’ late at 1129, more or less the same time it had done the previous day. It was then a waiting game for the arriving train from N’gaoundéré and the station platforms went into hibernation mode for over an hour. Madame Desiree told us that the train was now expected to arrive at around 1200 and when staff with hi-visibility vests started to mill about on the platform, well after 1200, we got the impression something was about to happen. We had a false start when a Bombardier MX620 appeared from round the corner, with nothing in tow, and then sat just outside the station at the north end; we later discovered this to be CC2205. 20 minutes later train 192 1915 (P) N’gaoundéré – Yaoundé appeared round the corner and something didn’t appear quite right. As the train got closer we figured out that there were actually three engines, all appearing to be MX620’s, on the train and could only assume that the train engine had failed and been rescued by the leading two locos. As the train hit the platform end, 3h45m late at 1245, the shunter walked straight into our lined up photograph and ran down the platform to get on the leading MX620 as it arrived. CC2223/CC2230 were multi’d up and both working but despite CC2203 still running on the inside of the trio, it obviously wasn’t in the best of health! 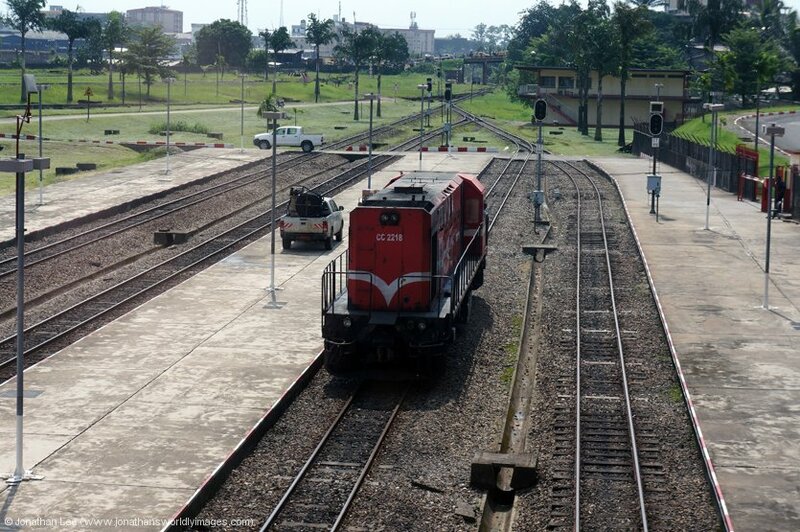 We managed to get a shift on and get to the front of the train, before the locos shunted off the two baggage vans at the front, and get a few photos from the embankment in front of the road bridge at the Douala end of the station. The driver on CC2223 gestured to us as we walked back to be wary of some of the guys hanging around by the parcel office; so we headed back to the platform, got a couple more photos, thanked Madame Desiree for her help and then kicked ourselves all the way back to the hotel when I figured out that we could probably have got a taxi out to Obala, the first station north of Yaoundé that the train stopped at, and done the damn thing into Yaoundé! ME Maps soon confirmed, back at the hotel, that it was a 38km drive that would have taken just over half an hour!!!! I guess had we known it had failed, which we didn’t, we may well have put two and two together and figured it out; but as we were expecting CC2203 to come in and then hopefully work back that night, we didn’t feel the need to even consider the move. 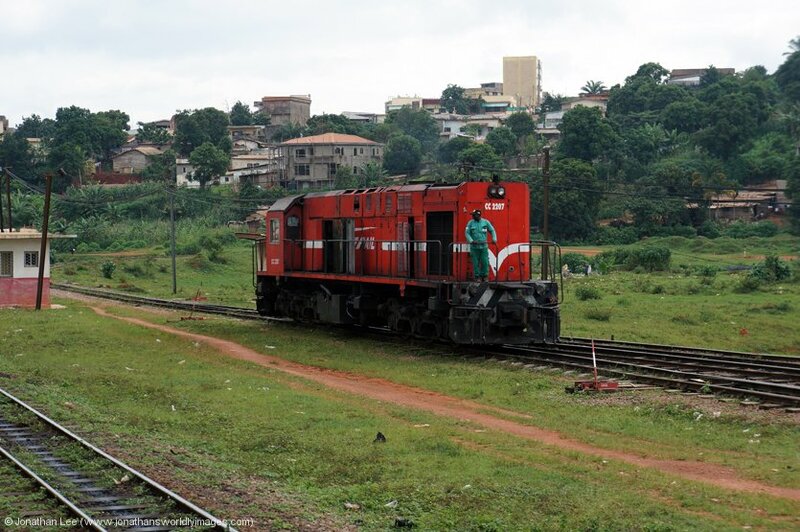 The only saving grace for our trip that night, was that there were now 4 MX620’s in Yaoundé to choose from! Another afternoon of air-conditioning and Euro 2016 football followed before the power went off in the hotel for the second time that day; literally minutes before the match finished! Turkey v Croatia was 1-0 to the Croats with seconds to go and we found out that’s how it finished while watching the highlights in N’gaoundéré the following day! The power cut was our cue to head down to the restaurant for a meal before our overnight trip. When we went back up to get our stuff and head out the power was back on in the room again. When we went back down to remind the hotel staff we wouldn’t be back until Tuesday morning again, when we were asked if we actually wanted to check out, save some money and make a future booking for Tuesday. Quite surprised that we’d been offered what we had, we paid up, got our bags from the room, left them at the hotel’s front desk and bode them farewell for a couple of days! It started to look a bit grim as we headed to the station and we weren’t surprised that the stock wasn’t in when we got there at 1800; after its very late arrival that morning. Our nerves were starting to get the better of us while we waited for the stock to come in and we’d never been so relieved when MX620 CC2205, as we’d half expected/hoped, brought the stock in and was immediately detached to run round it. Meanwhile boarding commenced, just as the heavens opened and a heavy downpour soaked all those attempting to board. After our tickets were checked at the door we were told which cabin to go to and were pleasantly surprised by the cleanliness of both it and the bedding on the berths; which included pillows, a sheet and a blanket; and later a toilet roll and soap were given out to each compartment to use communally. When a family of two adults and two children got into my compartment there was no chance of a swap to get Vic into mine; and then the farce began. A guy we’d been speaking to in the queue the previous day had managed to get himself 8 tickets for the train via one of CamRail’s agents, basically as we’d managed to get the last two tickets in the sleeper berths. Vic’s ticket had the same coach and cabin as he had all 4 berths in. As it turned out not only had our tickets been stamped for the wrong date, which had been the previous days, Vic’s had the wrong coach written on it. The saving grace turned out to be my reservation receipt as it had both a reservation date and travel date on it and Vic’s only had the reservation date; which everyone was thinking had been the same as the travel date. A quick phone call by one of the station staff soon had things rectified and Vic was shown to his correct coach and cabin. Unfortunately, there was no swap to be done there either and that was the last I saw of him until the following morning. When the rain had stopped I walked up to the front of our 17 coach train just to make sure CC2205 had ran round; and it was firmly bolted to the stock. Back in my cabin everyone was eating so I left them alone for a bit and had a bellow out of the window in the corridor as the train departed. Even from 10 plus coaches back the MX620 could be heard as it hammered out of town and past the carriage shed to the north of the station. Grindrod’s GPR30-01 was sat on a freight in the yard, facing north, and that was about the length of my bellowing; until the morning. While everyone was relaxing in their berths the coach stewardess came round asking if anyone wanted anything from the restaurant car and shortly afterwards the ticket checks were done; with the guard having two police officers with him to check everyone’s ID. Once this was over the compartment lights were out and I spent the evening shutting the world out with my Ipod; before eventually calling it a night at about 2300. Unfortunately, the compartment couldn’t make its mind up if it was going to be cool or warm but the bed was comfy enough to hope that wouldn’t be an issue as we staggered into the darkness. I eventually got up and headed to the restaurant car at about 8 o’clock and Vic wasn’t far behind. Unfortunately, the breakfast served wasn’t up my street and both the watermelon and avocado salad got left; leaving bread, croissant and coffee to be consumed; which was definitely better than nothing and cost 2500 XOF. As there was space and nobody else seemed to be making their way to the restaurant, we spent the rest of the journey in it and even managed to take a few photos out of the opening windows; of both the scenery and the MX620 heading round curves with our 17 coach train. Arrival into N’gaoundéré was at 1025, which according to the CamRail leaflet is 1h25m late on the booked 0900 arrival. As we approached N’gaoundéré station Alstom BB1109 was found shunting the industrial sidings just outside the station; which are set up with shunt spurs off the main line into each and all looked to have some traffic in them and the wagon transshipment sheds looked to be busy with people. One side of BB1109 revealed the “0” and the “9” to have been put onto the loco side in a rather unruly fashion and in a completely different font to the other parts of the number; and it appeared that the figures beneath it may have been rubbed off before the new ones were applied. In some countries this could well have been a change of loco identity but as the rest of the numbers on BB1109 all looked ok we assumed CamRail had replaced worn out digits? N’gaoundéré station is partially on a curve and we couldn’t resist taking a photo after arrival as the sun was perfect on the train and MX620 CC2205 looked nice lit up in it. We spotted people walking across the tracks in front of the train and soon discovered that it was a public right of way; so us venturing over the tracks to the wrong side of the train didn’t hurt anything and the train even partially obscured us from view while we snapped away. Behind us was the carriage sidings, loco shed, which had nothing on it at all, and a turning loop which we noticed on ME Maps. After walking back onto the platforms, we exited the station through the exit for passengers from the sleeper coaches, with all the exits being marked for which class of tickets can be used at them. Tickets were checked as we exited so don’t hide it away or leave it on the train! Once through the station building our immediate job was to purchase our tickets for the return journey that night. There are two ticket offices at the station front, not inside the station building itself, and of course we managed to pick the advance on to queue in first, before being sent next door to the one for on the day tickets. As you look at the station front, the office to the left is for on the day tickets and the office on the right is for advance tickets. There were only about 6 people in front of us in our second queue and it soon went down. The woman at the counter spoke decent English and when presented with the piece of paper we’d been given in Yaoundé, along with our passports, she soon found our names printed on the day’s departure in coach 1304; cabin 11. Tickets were soon written out and in our possession, having handed over the 28,000 XOF each for the privilege. Outside the ticket offices the prices for all classes of travel are posted on a notice board and above the station entrance is a white-board with all the fares for intermediate stations along the route to Yaoundé. After our successful ticket buying antics we used one of the many huts across the way from the station to relax with some cold pop before having an unsuccessful scan around for somewhere to get lunch; the only restaurant in the station area, on the far right above the row of selling huts opposite the station, was closed and the only other we found didn’t look at all appetizing, the strong smell of fish outside it putting us off straight away. So dinner became croissants and biscuits from the shop inside the station building, which were consumed inside the station building in its waiting area and from our very seats we spent the afternoon watching football with the station staff. Firstly, Brazil v Peru in the Copa America, which Peru surprisingly won 1-0 with a very controversial goal, and then Spain v Czech Republic in the Euro 2016, which Spain managed to scrape through as winners 1-0; and it wasn’t through want of trying to score! The two football matches whiled away most of the afternoon and people were starting to turn up for the 1915 departure south to Yaoundé as the Spain match finished, so we went outside for a walk round. Unfortunately, we weren’t allowed into the waiting room for sleeper passengers for half an hour so we went to see what was happening on shed; the answer was not much. BB1109 was shunting the stock about and CC2205 was shut down inside the shed. The Alstom machine had been piecing a freight up in the loop by the station during the afternoon as well. While we’d not had much to eat during the day, we didn’t want to spoil our appetite and decided to hold out and see what the train would produce; so didn’t bother with the now open restaurant above the shops. As we hung around by the waiting room for sleeper passengers I noticed some young guy seemed to be following us and mentioned it to Vic as I thought it might be because we had our rucksacks on our backs. When we changed direction so did he and when we did a second time, he followed suit so I headed straight towards the police that were in the area immediately outside the station entrance; where baggage security checks were taking place. Before I even got to them one of the guys doing the security checks noticed said guy and stopped him; when he was asked what he was doing he even pointed in my direction! Thankfully he was dismissed from the area and sent back out into the general area; where he immediately attempted to get into the sleeper class waiting room and was thrown out of that area too by the staff there. The guy had one of those looks of frustration on his face and was barely dressed, with a ragged t-shirt and pair of shorts; I couldn’t work out whether he was drunk or simple. Eventually some other staff noticed him and about 6 of them collared him, the result being him getting sandwiched between two man on a moped and removed from the station area completely! We were allowed into the sleeper waiting room at 1630 and the stock was shunted into the station by BB1109 shortly afterwards. Boarding commenced at about 1800 but unfortunately CC2205 didn’t come off shed until 1825, by which time it was starting to get dark; and there was a storm on the horizon as well! CC2205 had been turned and was short hood leading when attached to the train and just as it was being attached, the heavens opened so on we got. Our two berth sleeper cabin was second in from the end, so right over the bogies. It had a sink in it, unlike the four berth cabins, but the bedding was all the same. The coach attendant came down before departure offering food and while we initially settled for a 2000 slot in the restaurant car we eventually ended up in it at 1900; with beef stew, rice, bread, potato salad and pineapple in front of us before the train departed and headed straight towards the storm. It had been a good run to Bawa, the first stop out of N’gaoundéré, but the good run ended there. We had been stood for 90 minutes before we called it a day and went to bed, so quite how long we actually stood we don’t know. It was still hammering down with rain and almost constantly lightening outside, so maybe the delay had something to do with the storm, whether it be rain related or lightening related? Either way we were sock on before the train began to move again. It was nearly 9 o’clock when we surfaced and the first stop we ground to a halt at was Nanga Eboko at around 0915, which according to the Fahrplancenter timetable was 4 hours from Yaoundé; so technically, depending on which timetable we believed, we were either a little over 3 hours late or a little over 4 hours late; the latter based on an 0900 arrival time in the CamRail leaflet. At least we could hear the MX620 hammering away on the front when it got going, which sounded very good. Arrival into Mbandjock was just after 11 o’clock and we didn’t depart until 1147, still with 2h30m of journey to complete! 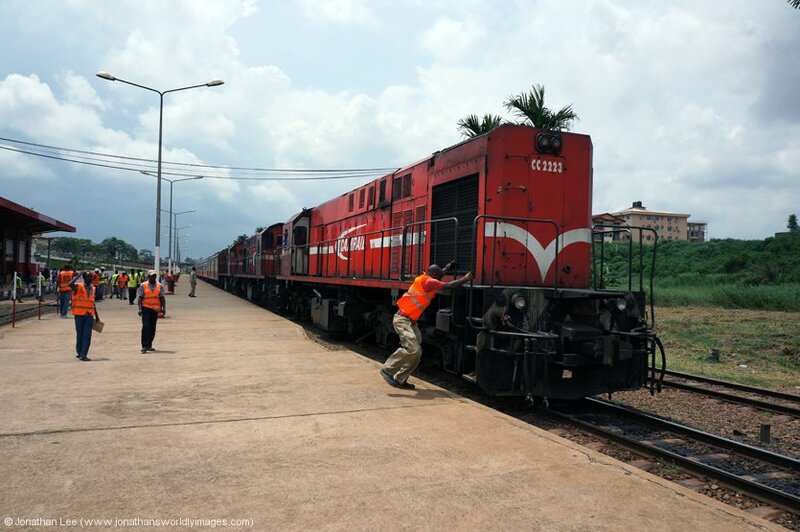 The reason for our lengthy wait turned out to be due to waiting for GM GT22CU-3 CC2503 to pass through with a military train; which had MX620 CC2204 inside it, and running. The run from Mbandjock to Batchenga seemed to be mostly downhill, given away by the fact the train looked like it was going off the edge of a ski ramp as it departed Mbandjock and the speed we were doing. The line is very uphill and down dale though and when staggering along it’s not always due to the crappy infrastructure; and putting your head out of the window to listen to how hard the MX620 is working is a giveaway as to just how much they struggle up the hills with load 17! Even 8 coaches from the front the noise coming from CC2205 was very audible and it was being driven well; and sounded like a very good example of an MX620; it was a big shame we weren’t right behind it but the 2 berth cabins are towards the rear of the sleeper coaches heading south, with the 4 berth being closest to the engine, behind the two baggage cars. We’d been bored with the journey long before we reached Batchenga but due to the track condition we seemed to lose a fair bit of time from Mbandjock but at least CamRail seemed to be renewing the rails and sleepers on the section with quite a lot of work going on; with all the old rails and sleepers still alongside the tracks so it must have been recent work? On arrival into Batchenga I noticed a load of bottled water piled up on the platform and assumed it was for all the staff working on the tracks. After departure though staff came through the train handing out 1.5L bottles of water to everyone and they were followed by others with bags of freshly baked 2ft long baguettes and then finally others with boxes of tinned sardines; the later wasn’t entertained so bread and water it was for breakfast; it was certainly better than nothing. Arrival into Obala signified the end being nigh! At just 35km from Yaoundé it was a small hop from there to town; but it was a slow one on the outskirts of Yaoundé as it was uphill virtually all the way into the city and we had plenty of entertainment from the MX620 as it twisted and turned its way through the Yaoundé suburbs. Children lined the edges of the tracks and waved at the train as it staggered by but we were warned by security staff on board that sometimes they throw things at the trains. 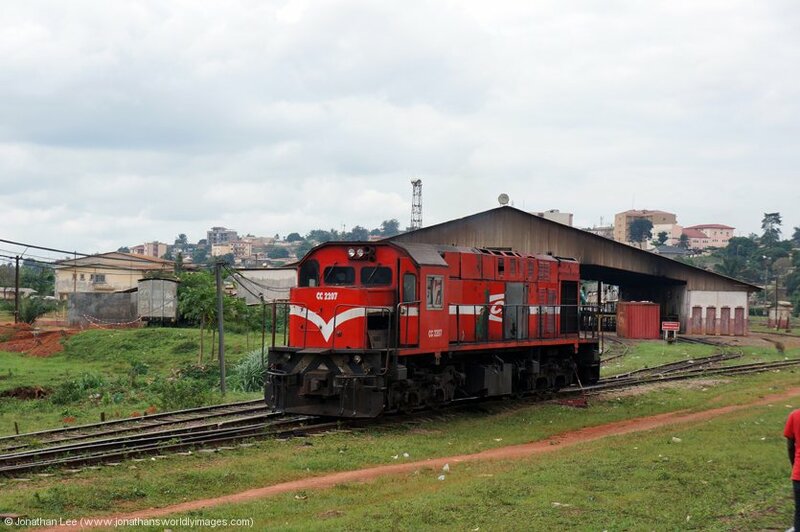 Thankfully we had no such incident and were rolling by Yaoundé shed as a pair of MX620’s ran between two sets of wagons, seemingly running round a freight in the yard, and MX620 CC2207 dropped towards the shed itself. 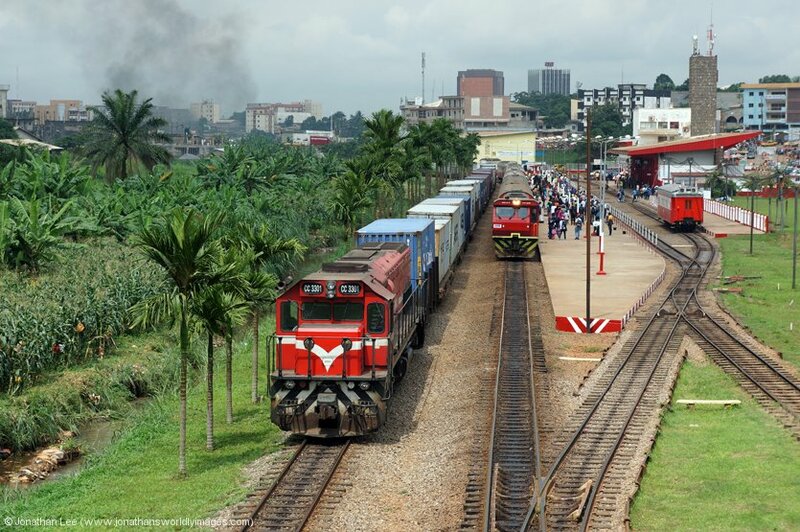 At just 5h50m late CC2205 brought its train to a stand in the platform at Yaoundé at 1450; it should arrived at 0900! It was nice to rediscover what our legs were used for…. As our coach was right outside the exit, we were first out of the station. Having dismissed all the advancing taxi drivers, we headed straight to the Brussels Airlines place that we’d discovered, just round the corner from the Hotel La Falaise. Having done the trip to N’gaoundéré once, we weren’t about to head straight back that night and the following night (Wednesday) would in theory be GM CC2506; and that was the last trip north we could do as we needed to be back in Yaoundé on Friday morning to do the morning Intercity to Douala on Saturday and fly home Friday night. So to put it in simple terms, other than going back north that night, which wasn’t happening, there literally wasn’t anything else we could do, so staying until Saturday was a bit of a waste of time. We’d already figured out that Ethiopian Airlines offered a flight via Addis Ababa for £372 from Yaoundé; so that was our benchmark when we walked into the Brussels Airlines place. There was a security check outside the front door at Brussels Airlines and we were handed a ticket number before we entered. We only had to wait about 10 minutes before we were sat in front of a desk. The very helpful woman tapped away a bit on her computer and then wrote some figures down on a piece of paper; basically the computer said yes! To change the flights to Wednesday night, instead of Saturday night, cost us £309 each, or 256,600 XOF. The transaction was all very simple and we were even allocated seats before we left the building. Airline tickets booked we thought it a good idea to check back into the Hotel La Falaise before doing anything else; after all they had been expecting us that morning! That done we weren’t really in the mood to head back to the station to get tickets for the 1025 Yaoundé – Douala Intercity the following morning so we decided to head over to the Hotel Hilton, where according to CamRail’s advertisements one of their “agents” was housed; which sold CamRail tickets. Having gone through the same security rigmarole at the Hilton, as we went through at the La Falaise, we were directed back outside and along the roadway, turning right out of the front doors. The agent was called Finex and we found their building set back from the pathway, but with a sign outside, about 50 yards down the road; which if you look at the Hilton from the front, is to the left of it. The place was empty and we were served straight away. We had no problem booking two tickets in 1st Class for the 1025 Yaoundé – Douala for the following morning; and looking at the process it seems that each agent is allocated specific seats on a daily basis and the same process is applied as if you bought the tickets from a station, albeit that the receipt is written by the same person that then writes the tickets out. I did have to pay at another window though but it was no hassle at all and took seconds. The pricing at Finex was exactly the same as it would have been at the station, 9000 XOF, and was way less hassle. I highly recommend buying tickets from an agent if there is one nearby where you’re staying, in whichever city you happen to be in. The only thing left to do, when we got back to the hotel, was book some tickets home from Kings Cross to Doncaster and while Vic got on Realtime Trains to check the train formations I got on the Virgin East Coast website. We booked the 1335 Kings Cross – Doncaster £20.50 each, safe in the knowledge that it was booked a 9 and not an HST. The good thing being at the moment was that Virgin had allowed tickets between Doncaster and Kings Cross and vice versa to be used up to either an hour earlier or an hour later; but only up to July 23rd, which is obviously when the kids break up for Summer! All set for a three-day early retreat to the UK we had a relaxing evening and even watched the mighty Portugal struggle against Iceland; the score being 1-1 at the end. It was good to clamber into a bed that wasn’t moving that night and not have to endure the noise of the bogies and buffers all night! After a nice leisurely morning, which included breakfast, checking in online for our flights and having the boarding cards printed at the hotel, we checked at 0930, got ourselves a taxi to Yaoundé station, costing 3000 XOF, and were surprised to find IC151 0600 Douala – Yaoundé already in the station when we got there at 0940; it had been a minimum of 40’ late every time we’d seen it! 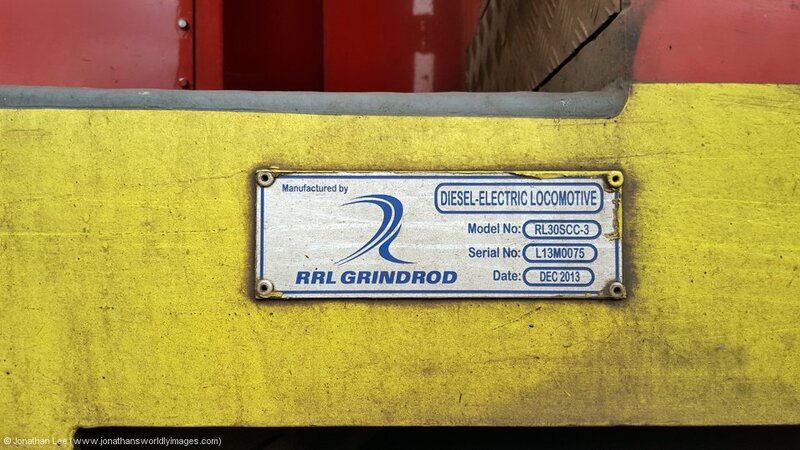 Unfortunately, Grindrod GM RL30SCC-3 GPR30-07 was still glued to the train and at the fourth time of asking I managed to get a photo of its works plate, which is only on one side, to reveal its serial number as L13M0075 of December 2013. 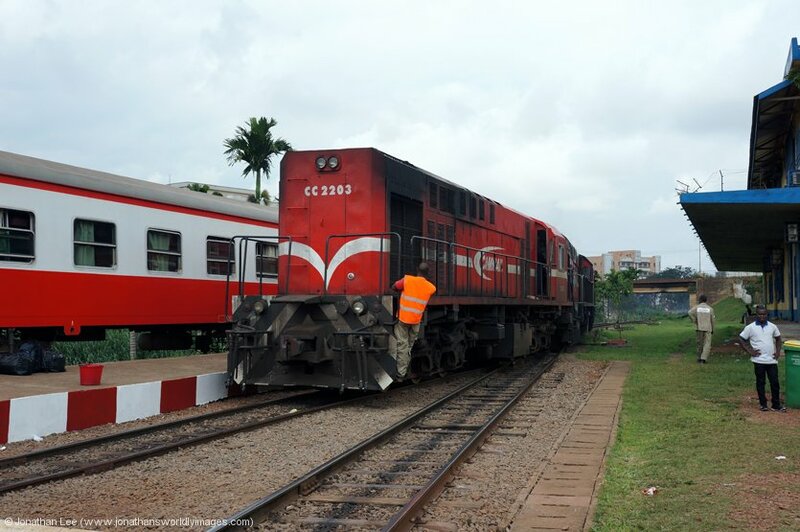 While this didn’t mean a great deal to me it would to those that needed to confirm which of the ex-Transnet Leasing RL30SCC-3’s had been renumbered to what in Cameroon. 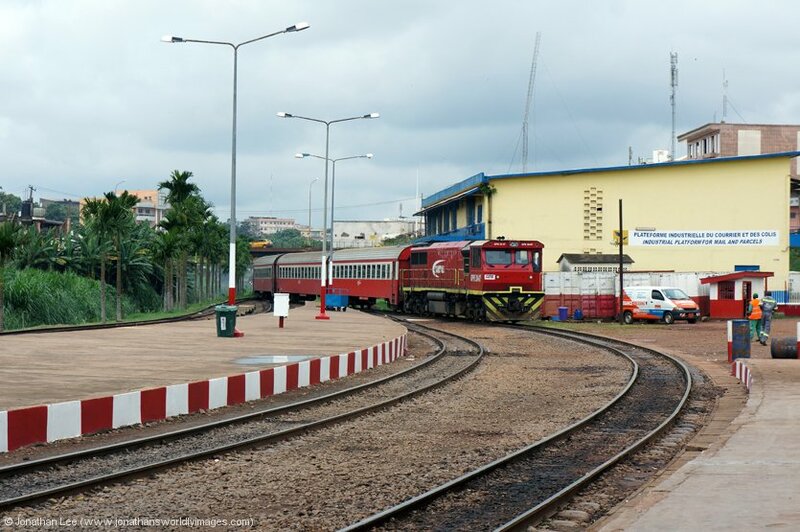 Whistles for departure started at 1020 and at 1024 GPR30-07 got IC152 1025 Yaoundé – Douala underway. 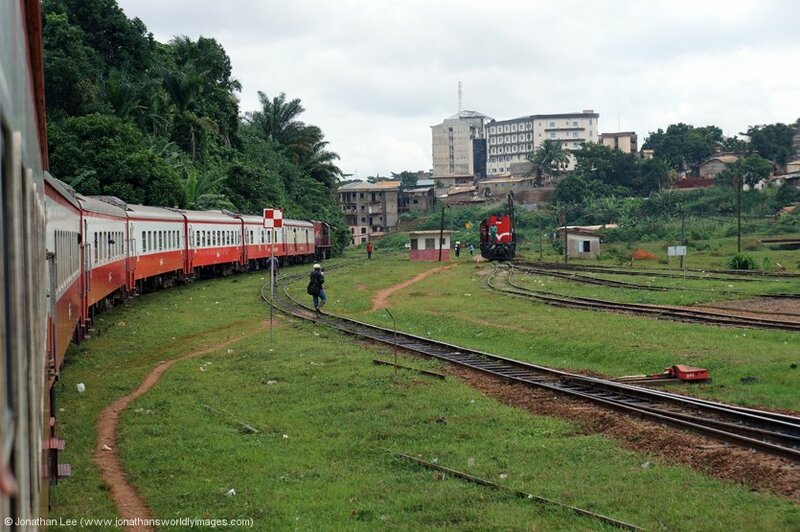 The train wasn’t as full as the 1445 Douala – Yaoundé had been when we’d done it and there were plenty of empty seats. Before we’d even got out of the Yaoundé suburbs bottled water and a sandwich had been handed out; and the train was soon up to speed and bowling along in a non-smooth fashion! 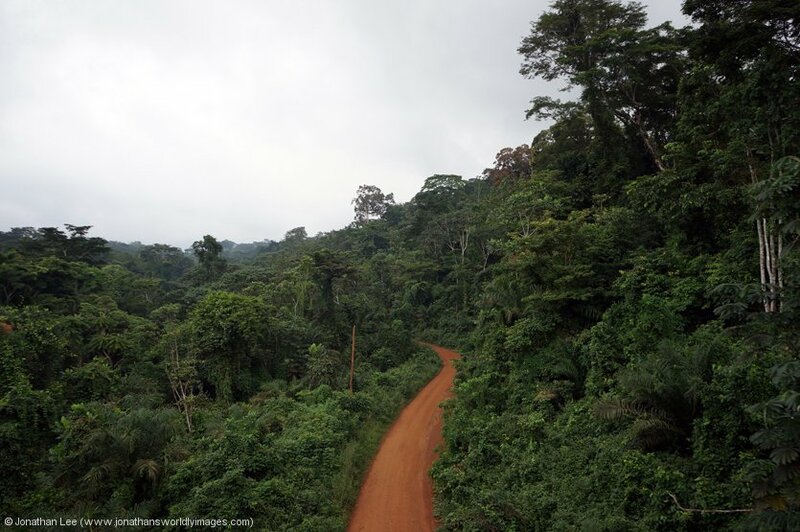 This time we had seats by a window and not a partition, the scenery outside, virtually all the way to the Douala suburbs, is like travelling through a rain forest and at seemingly treetop height. It was quite an atmospheric journey with mist drifting over the trees and there seemed to be a dampness in the air as I took some photographs out of the toilet window; the only one that I could open in the whole coach! This journey wasn’t non-stop like our journey across from Douala but was definitely full of non-stop jolting and rough riding. The line speed is good but the ride quality only matches it at the Douala end of the line. 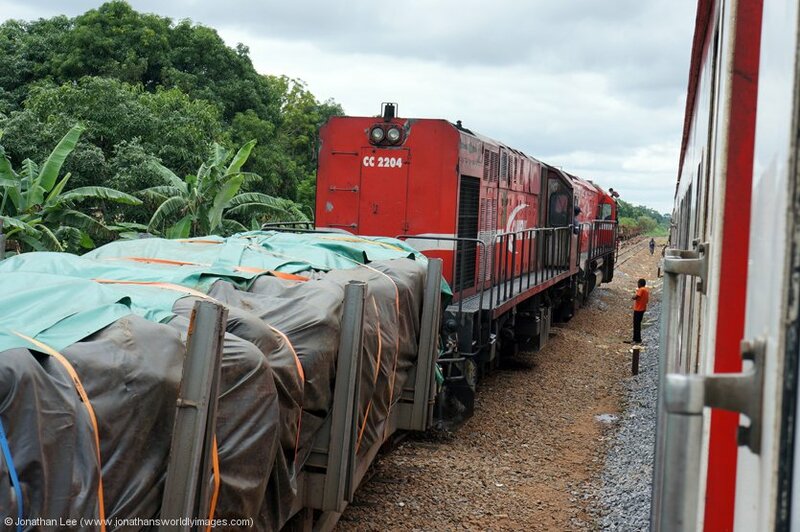 The crap Chinese coaches with freight train couplings don’t help either! At Edea Croisement we passed Bombardier MX620’s CC2203/CC2210 with a freight, so CC2203’s issues a few days previous couldn’t have been too terminal, then at Loungahe Alstom BB1108 was sat waiting for us to pass through with one coach and some wagons loaded with sleepers. 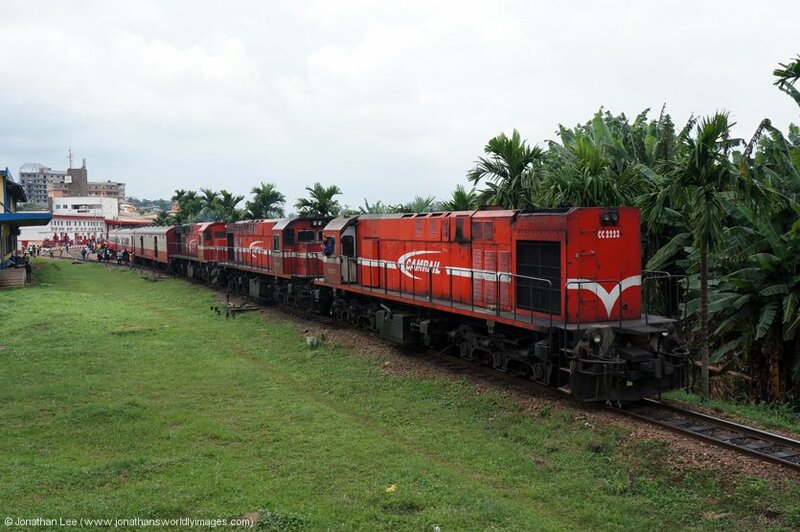 The next train we passed was at Douala Bassa, on the outskirts of Douala, which had Grindrod RL30SCC-3’s GPR30-05/GPR30-04 heading a loaded container train. 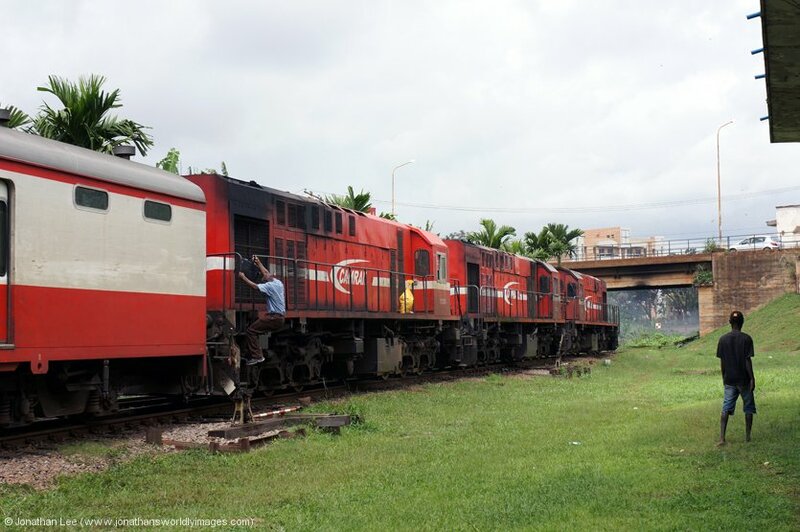 As we ran by the Douala shed area BB1210, GT26CU-3 CC3302 & Bombardier MX620 CC2207 were noted; with other MX620’s also on shed. As GPR30-07 drew IC152 into Douala, at 1413 about 8’ late, scruffy looking and still in original green livery MX620 CC2228 was shunting petrol tanks over the back of the station yard, while GT22CU-3 CC2505 was shunting in the main yard. It wasn’t a quick exit from the station as everyone had to use the 2nd class exit towards the rear of the train and it was slow going up the stairs. With plenty of time to kill until our 2130 flight from Douala we went for lunch in the restaurant at the station; the menu being completely different to our previous visit but mainly centered around fish dishes. Afterwards we went to have a look round the outside of the station area to see if we could catch a glimpse of CC2228; which of course didn’t materialize so we headed over the large station car park towards the main road to get a taxi to the airport and while the time away there. As we did I took one last photo, of Douala station, and got ranted at by a security guard over the way; who I completely ignored and made a bee line for a waiting taxi. The journey from Douala station to the airport took about 15 minutes and cost 4000 XOF. 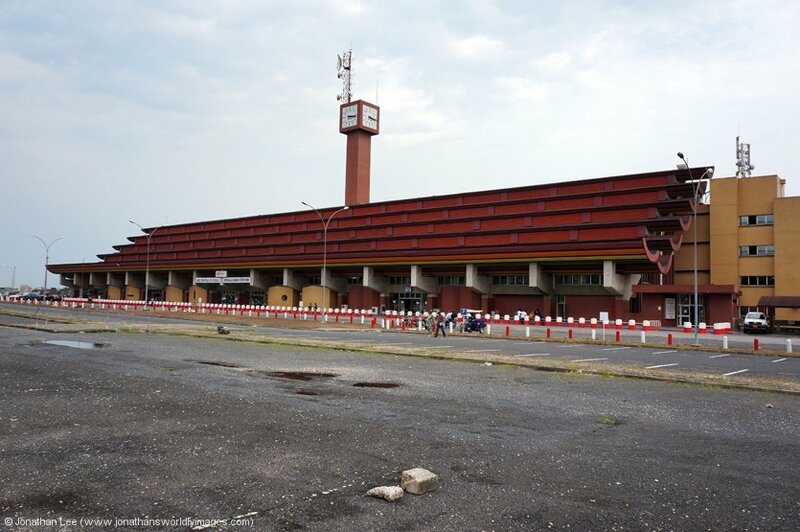 We assumed that Douala airport would have somewhere out of the way and cool to wait it out, after all we did have nearly 6 hours until our flight departed; we couldn’t have been more wrong! Douala airport is quite possibly the worst airport I’ve ever had the misfortune of festering at! It’s literally falling apart at the seams with the waiting area before check-in having limited seating and there’s no AC at all until you get to a departure gate. There are no restaurants anywhere at the airport and only one bar but at least cash machines are plentiful. It was a hot and sticky 3 hours of festering before Vic checked his bag in, which itself was a farce and took way longer than it needed to. After check-in, boarding cards are checked and luckily for us we figured out where to get a departure card from, to fill out before immigration. Gate 32 was at the opposite end of the airport, which makes a bit of a mockery of things when everyone is loaded into a bus to be transferred to the plane anyway! While the waiting area at gate 32 is air conditioned it is less than adequate and the toilets are nothing short of a disgrace; with no toilet seat let alone toilet roll and the place was swimming in water, which was leaking from the ceiling and onto the lighting above; a disaster waiting to happen. 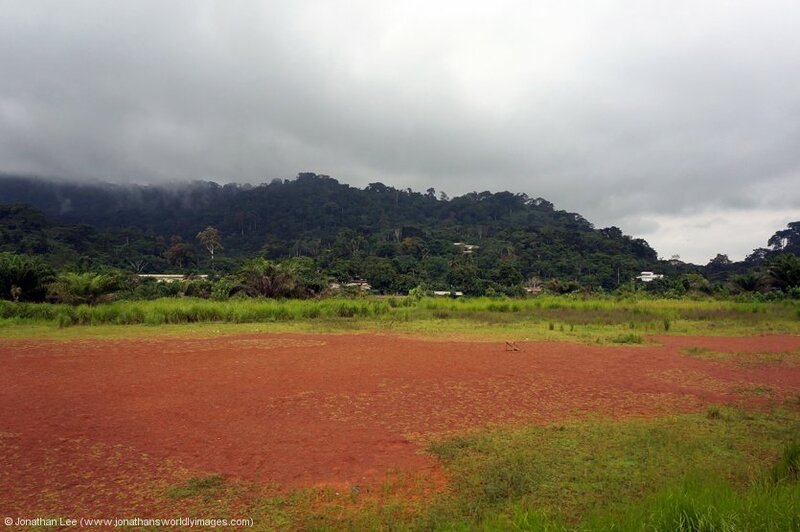 Needless to say, when we started boarding at 2130, which was incidentally departure time, I was so very glad to see the back of Douala airport and board the plane, which was only just arriving from Yaoundé as we set off from the gate on the bus. Our Brussels Airlines flight was lightly loaded when we boarded and we had to sit for 45 minutes while it was refueled and the bus was sent back to the gate to collect the remaining passengers; which is what happens when you use a coach to transfer people instead of a proper airport bus with plenty of room. Departure ended up being at 2230, 60’ late, and food was very efficiently served the moment the fasten seatbelt sign went off; it was then time for the earplugs and a bit of shuteye! Arrival into Brussels was at 0540 and a decent amount of sleep had been accumulated on board the plane. Once through the security rigmarole and at our connecting gates we only had 4 hours to kill before our 0955 Brussels Airlines flight forward to Heathrow; the surroundings were way, way superior to those we’d endured at Douala airport the previous day and to be fair we’d probably have been in better surroundings had we festered at Douala station instead! The pride of Brussels Airlines’ fleet, Airbus OO-SNA painted in a “Belgian’s Red Devils” livery to commemorate the national football team, turned up at 0920 to take us home. The plane was full, according to the lady going round the waiting area with baggage tags; who was ruthlessly tagging anything she could find so I stood with my back away from her while she was in my vicinity. Unfortunately, the pride of the fleet seemed to take a while unloading and the resulting boarding wasn’t until around departure time; which seemed to annoy some of the waiting passengers. I think they’d come off our flight from Douala judging by the time they’d told the staff how long they’d been waiting; but getting out of bed about a 20-minute delay is just crap; and they really needed to get back in their box! With a couple of circles over east London and then a detour to the west to approach via Windsor Castle, we eventually touched down at 1035. As per usual my passport didn’t work at the e-gates but at least I was told it was due to my name being common and needing to be checked on arrival. A mad dash to the luggage carousel had us waiting for 25 minutes for Vic’s bag to come out and it would have been longer had it not been for me and another guy shuffling the bags together as they went by; so the sensors could allow more from down below to actually be dispensed! We weren’t on the underground from Heathrow Terminal 123 until just after 1130 and didn’t think we’d stand much of a chance in making the 1235 Kings Cross – Leeds; especially as we still had to pick up our tickets from the fast ticket machine at Kings Cross. When we alighted at Kings Cross underground with 11 minutes to go we made a bid for the ticket machines, gathered our tickets in seconds and were at the front of the train on platform 3 before the whistles even started to go. The bonus being that our tickets were for the 1335 Kings Cross – Leeds but as Virgin East Coast were allowing tickets between Doncaster & London to be used up to an hour either side of their booked validity until 23rd July it was a win for us! 91114 did the honours but there was a bit of de ja vu as we rattled along the ECML above the bogies in coach B, it was a very similar ride quality to that of the Yaoundé – Douala Intercity the previous day……..
I’d only ever departed one other country early, which was Burma back in 2009 due to the humidity, but I have to say that it was a great relief to be heading home early and with the prospect of 3 days to relax before going back to work, as opposed to 2 and a half hours had we arrived back on Sunday as planned, was just tremendous! Luck, it seemed had been on our side in Cameroon and I was grateful of it as at the start of the trip I was dreading going there and not achieving what we set out to; which was get one of the Bombardier MX620’s in. Senegal on the other hand was way better than expected but has potential to go drastically downhill if PTB’s YDM4 issues doesn’t get resolved soon. 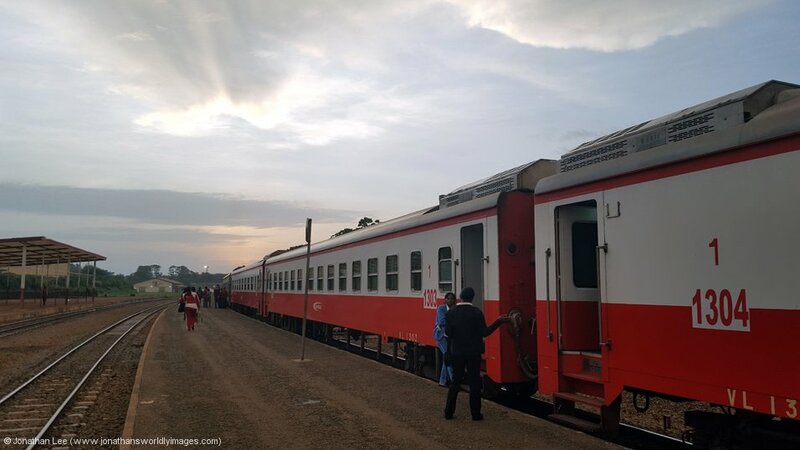 So all in all a good time to have gone and I’d really like to go back and do Senegal again when the additional trains run to Touba; hopefully with Mali and/or Benin next time?